Hello FRIDA friends…or shall we say, FRIMEX friends! That’s right! In case you haven’t noticed, we’ve made a slight update to the blog. Now, we will be sharing updates on behalf of FRIDA’s parent FRIMEX Hospitality Group, which includes FRIDA TACOS, FRIDA CATERING, DIEGO TACOS and the TASTE OF MEXICO! 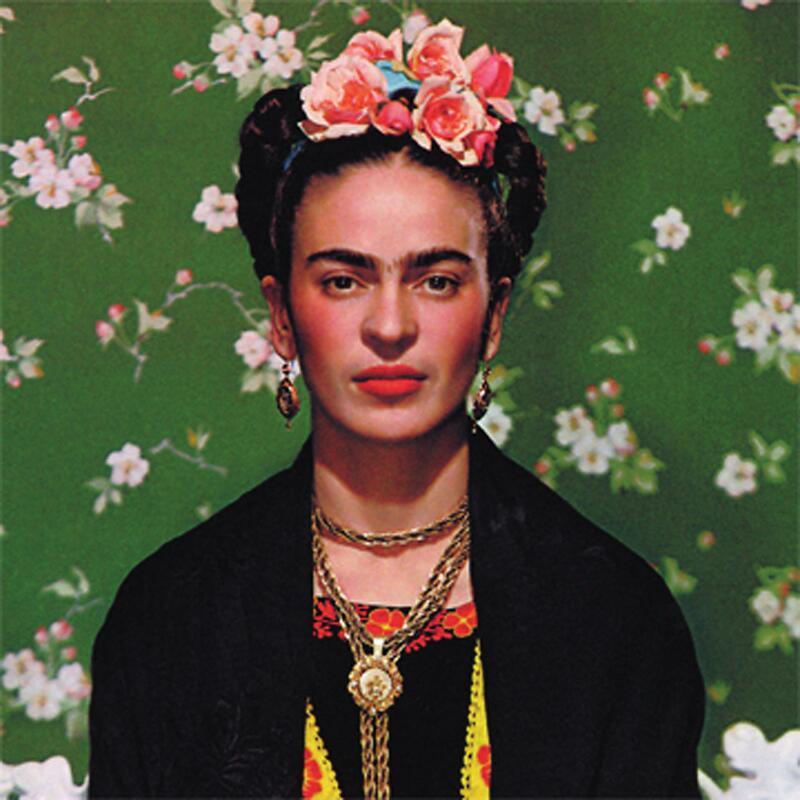 Basically, this will be your one stop shop on all things FRIDA-related. And speaking of which, we thought we’d kick off the first official post with a Happy Halloween theme. Yes, it’s hard to believe that we’re less than one week away from All Hallow’s Eve. And as you start planning your parties and trick-or-treating events, we wanted to make sure you were informed on the fun things our restaurants have in store. 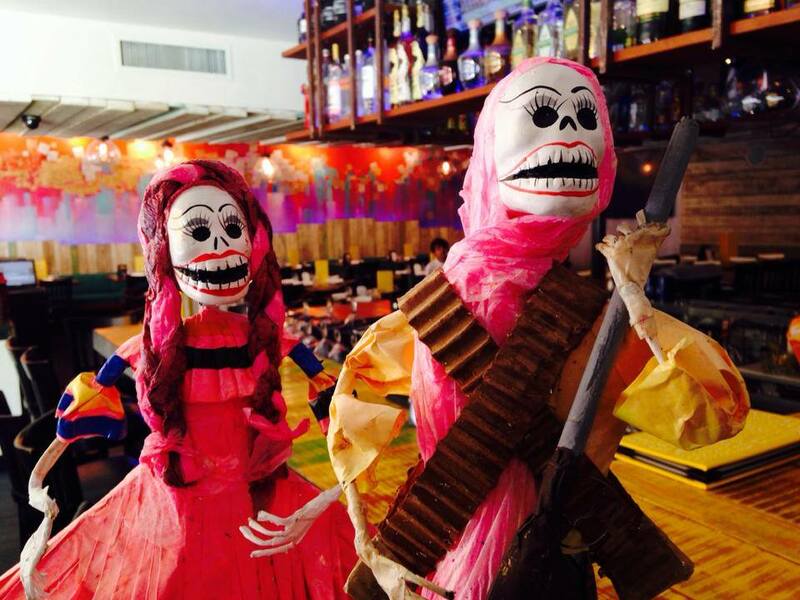 FRIDA TACOS is offering some fantastic options for those of you with younger Halloween fans. 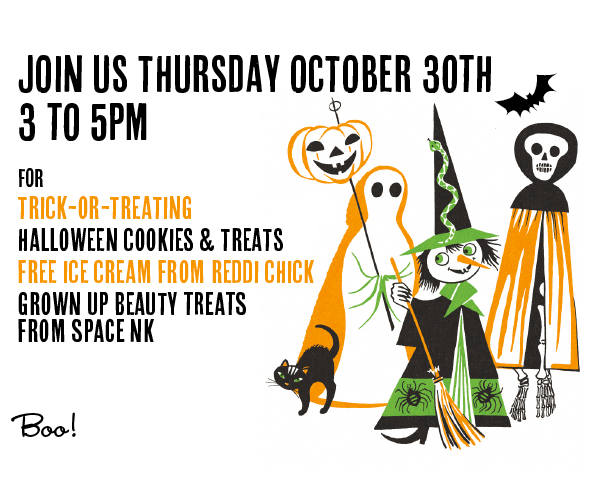 Our Brentwood Country Mart location will be hosting a Thursday early Trick-Or-Treat night, with cookies, candies and ice cream. As always, our Taqueria will be front and center; complete with themed decorations and delicious Mexican options for the hungry haunters. 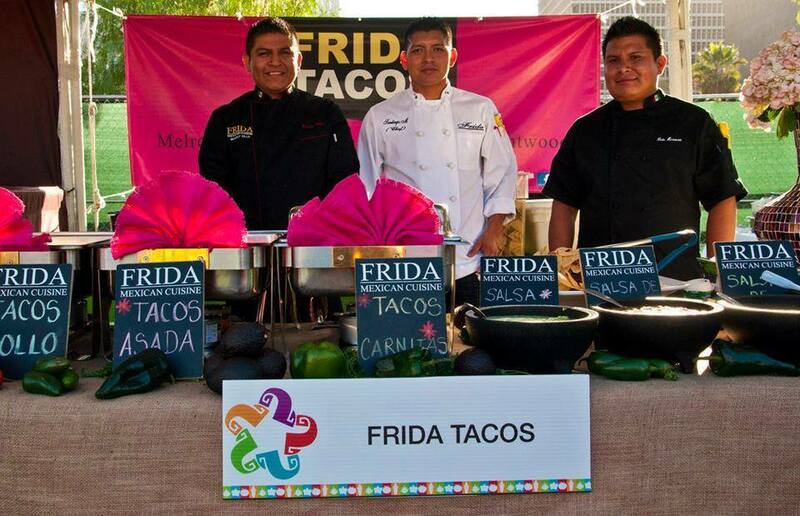 FRIDA TACOS Westside Pavilion will have some great options too, with Mall giveaways on October 31. This event runs from 5-7p and is certain to be a safe and fun option for westside parents. And on Halloween night, drop by either Beverly Hills or Westwood. We’ll be open until 10pm and serving Happy Hour drinks and appetizers for the grown up costumed crowd. One other option is to reach out to FRIDA Catering. If you happen to be hosting any Halloween events at home or at your office, we can come and provide an endless supply of Mexican treats. Cocktail options can be worked out too if you want your Halloween Fiesta to go late into the night. Several packages are available, which you can learn more about by contacting our team at (310) 278-7666. 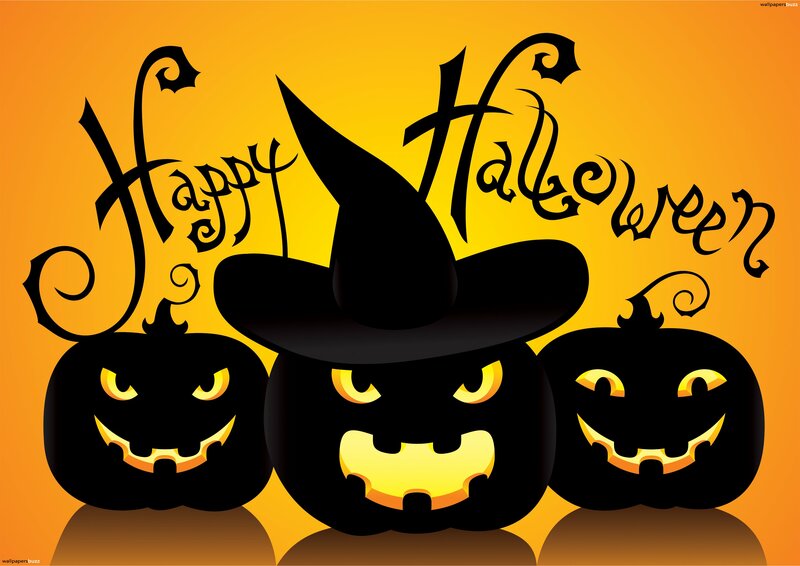 We would love to celebrate this festive occasion with you, so pick out your favorite costume…. And have fun at FRIDA this week! 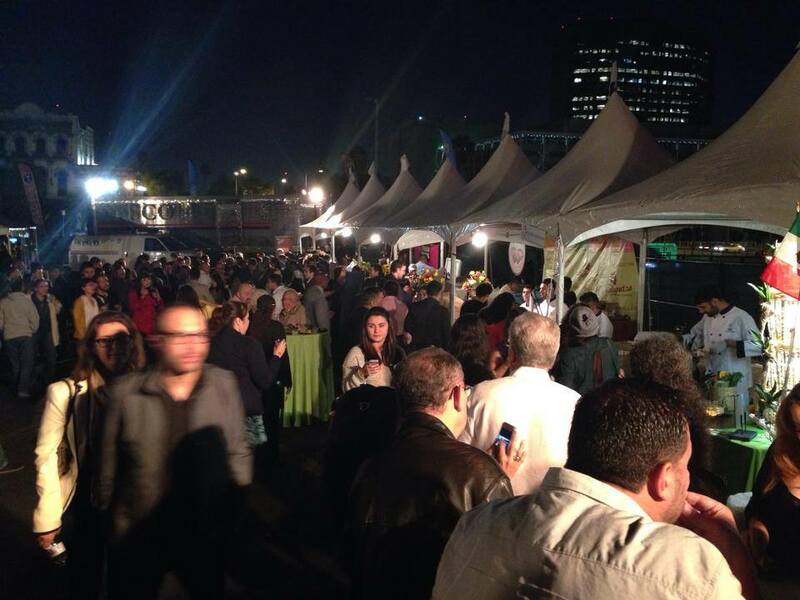 New Details On TASTE OF MEXICO 2014! As you’re probably well aware, we’ve got another amazing TASTE OF MEXICO event lined up for September 27. 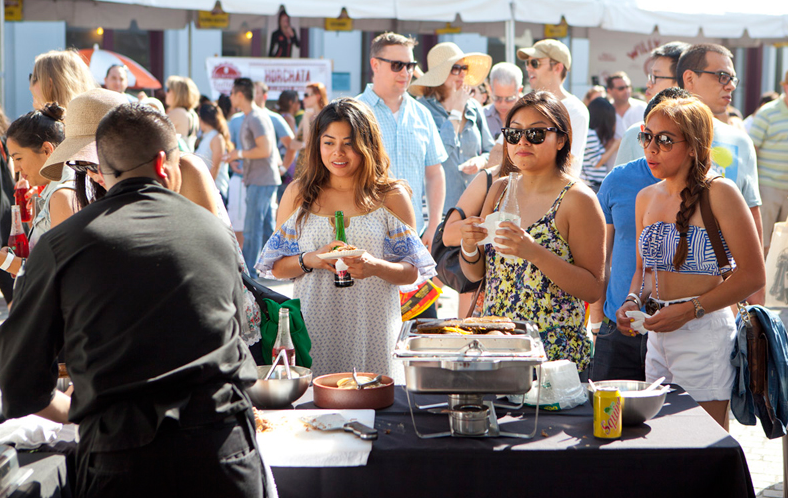 Just like every year, it promises some of the finest Mexican cuisine in southern California with restaurants like La Casita Mexicana, Guelaguetza, La Monarca and, of course, FRIDA all participating. 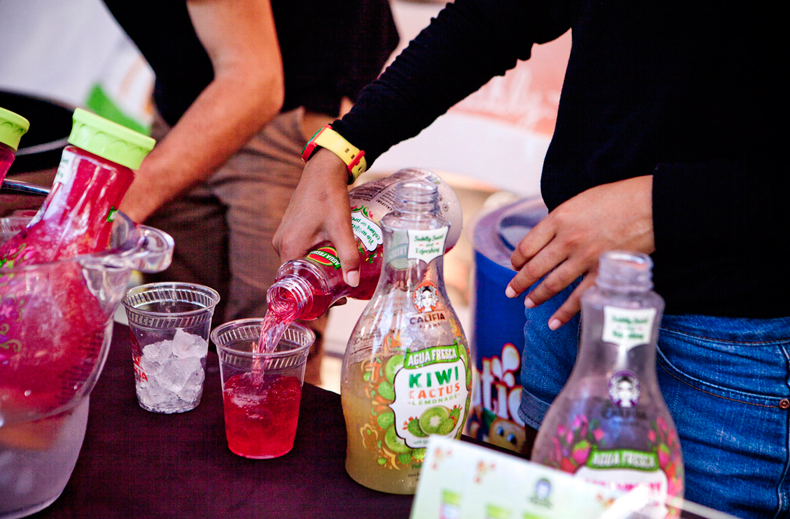 There will also be plenty of new partners this year, including Tecate, Aguacates de Mexico and Las Palmas. Plus, local favorites like Yuca’s, Loteria, Mexicali and MexiKosher, among others. But beyond that, we’ve created special new features for families and high-end food connoisseurs. This year, TOM will be offering a special Farmer’s Market Picnic Brunch, which will includee cooking demos and a full wine garden. It will also have unlimited tastings from all of the restaurants at a lower price point than the evening ticket. The dinner and cocktail event promises to be even more amazing that years’ past, once again utlizing the beautiful landscapes of downtown’s La Plaza de la Culturas y Artes. From 7p-11p, you can mingle with the chefs from all of our partner restaurants, learning recipes and testing out new menu items. There will also be a Mexico Tequila Bar, beer gardens and live music from A Poco No! Artist Ernesto Yerena will be on site too, displaying his visual masterpieces. Now if you want the best of both worlds, we can certainly arrange that too. This year’s VIP All Day Pass costs just $20 more than the traditional ticket and will grant you access to the Picnic Brunch AND the Dinner Event. There will also be early admission access and special gift bags. Our founder Vicente Del Rio will be on site for both events, sharing his insights as a Mexican master chef and a restauranteur. CLICK HERE for details on tickets and watch the clip below for a look back at some of the best moments from 2013! 3rd Annual Taste of Mexico from Jaime Alexander Ballesteros on Vimeo. Thanks To All Who Joined Us For TASTE OF MEXICO 2013! What an incredible Friday we had last week. 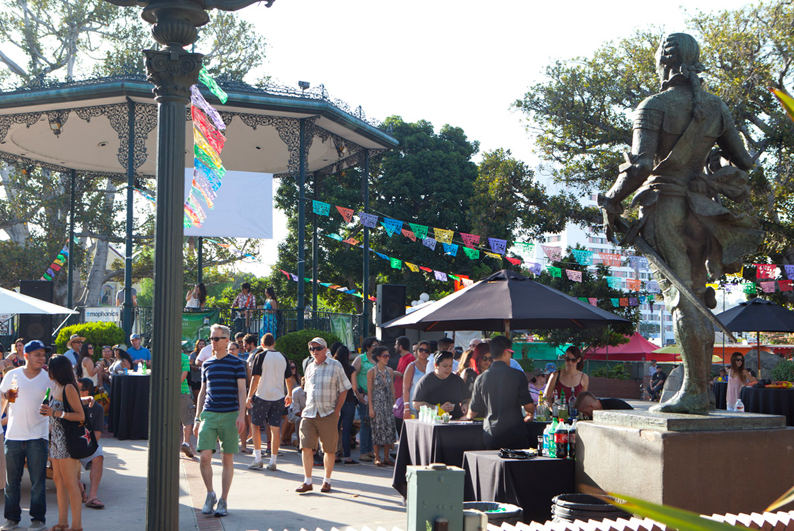 To our delight, hundreds of Mexican food fans descended upon LA Plaza de Cultura y Artes for TASTE OF MEXICO 2013. The turnout was spectacular and included guests from all across Southern California. To our sheer delight, Mexican Ambassador Eduardo Medina-Mora kicked off the event with an impassioned speech about Mexican culture and its impact on Los Angeles. From there, the famous TOM chefs gathered for photo opps and meet-and-greets, sharing “trade secrets” with dozens of fans. Our own Vicente Del Rio proved to be quite popular, getting interviewed for local news outlets and proudly shaking hands with a huge line of FRIDA fans. As for our comida selections, we proudly served up our famous Carnitas, Pollo and Steak Tacos and had delicious ceviche samplings (much like what you’ll find at the FRIDA Westwood Brunch). 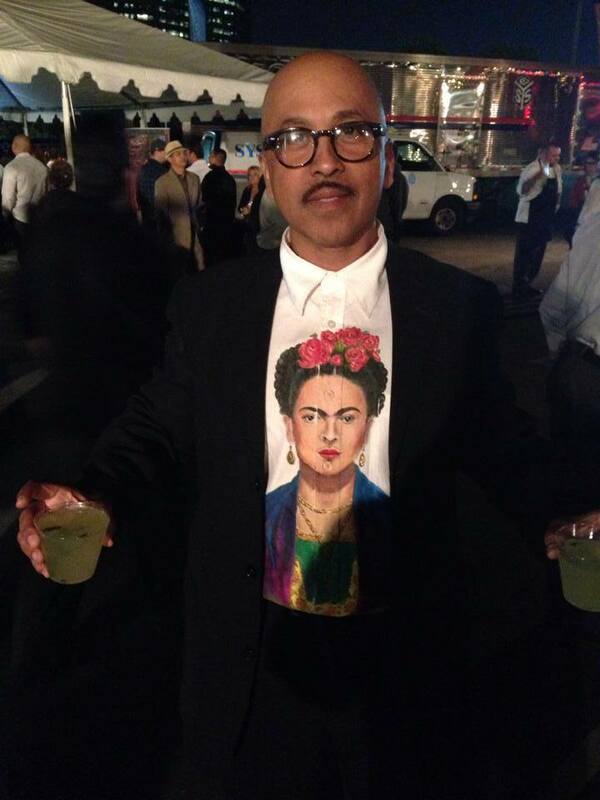 Fans made sure to show their FRIDA love, even donning apparel inspired by our famous namesake. 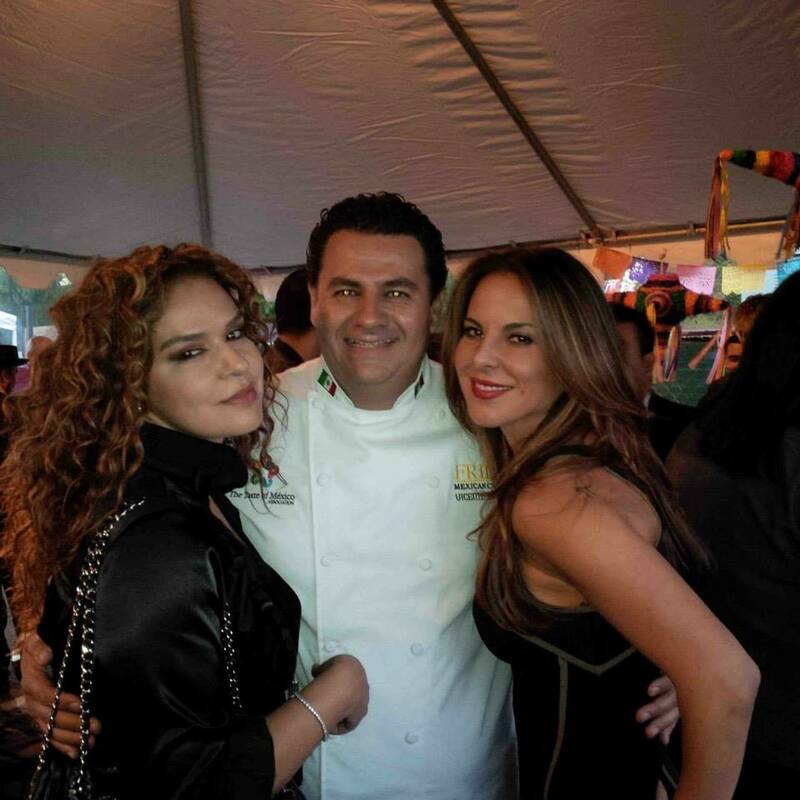 One huge highlight was getting the opportunity to hang with our friend Kate Del Castillo. One of Spanish television’s most popular stars, “La Reina Del Sur” couldn’t have been more gracious. She happily posed with fans and scored us quite a few ReTweets from her picture with Vicente. Those who follow us on Twitter got live updates throughout the night, highlighting everything from the mariachi singers, to the lively speeches, to the delicious appetizers served by our fellow #TOM participants. Overall, it was a fantastic night and one that we intend on repeating year after year! To everyone who stayed until the end, we hope you enjoyed your goodie bags. And to those who couldn’t make it out, stay tuned for details on TASTE OF MEXICO 2014! 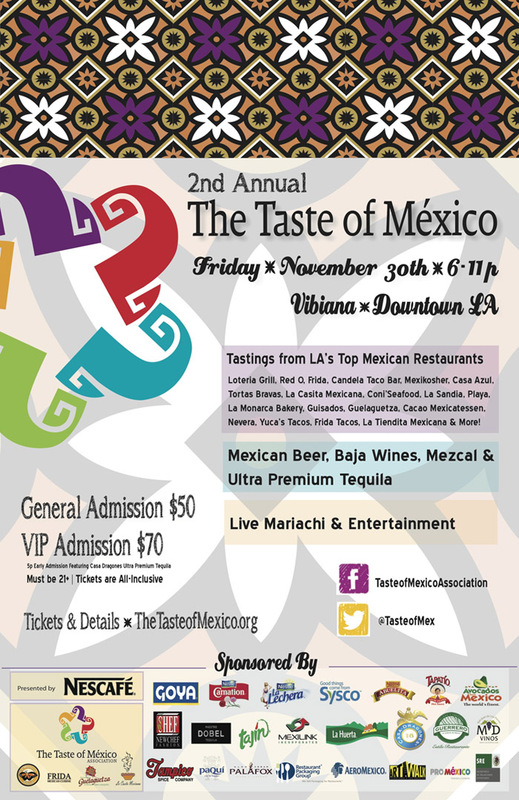 The 3rd Annual TASTE OF MEXICO Event Is This Friday! Clear your Friday schedule. 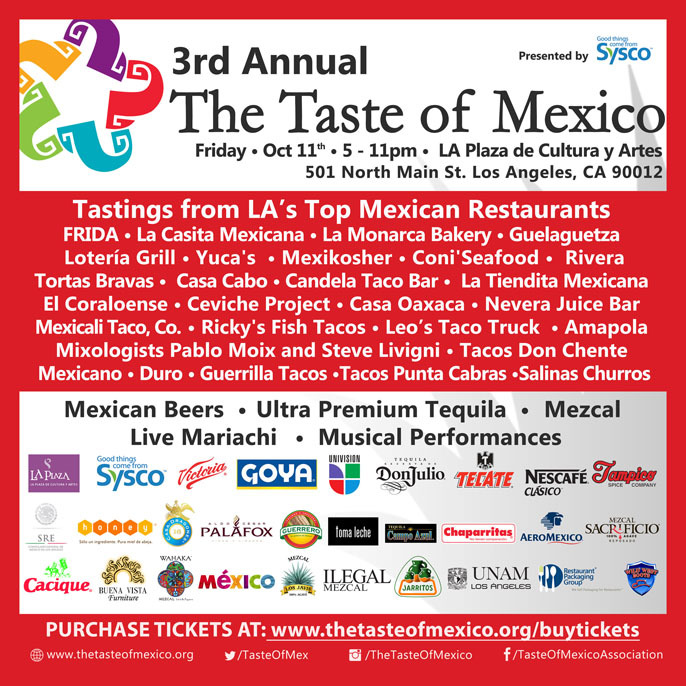 Starting at 5pm on October 11, FRIDA will be co-hosting the 3rd annual TASTE OF MEXICO celebration at La Plaza de Cultura y Artes in Downtown LA. And if you’ve been to either of the last two events, you KNOW this is a night that cannot be missed! For year three, we’ve brought on even more top tier Mexican restaurants, including El Coraloense, Casa Cabo, Ricky’s Fish Tacos and Casa Oaxaca. Plus all of your past favorites like La Monarca, Gueleguetza, La Casita Mexicana, Loteria, Yuca’s, Coni Seafood and MexiKosher. Bottom line — This event is going to be BIG and we’d love for you to join us. Entry tickets get you unlimited samplings from every restaurant, along with Tequila Tastings, exotic beers and 6 hours of live entertainment! You will also come face-to-face with the proprietors of all your favorite Mexican restaurants (including our own Vicente Del Rio). Ask about your favorite dishes, pose for photographs and learn firsthand what goes into authentic Mexican cuisine. Mariachi fans are in for a big treat too, as we’re bringing along some of the most talented musicians in Southern California. 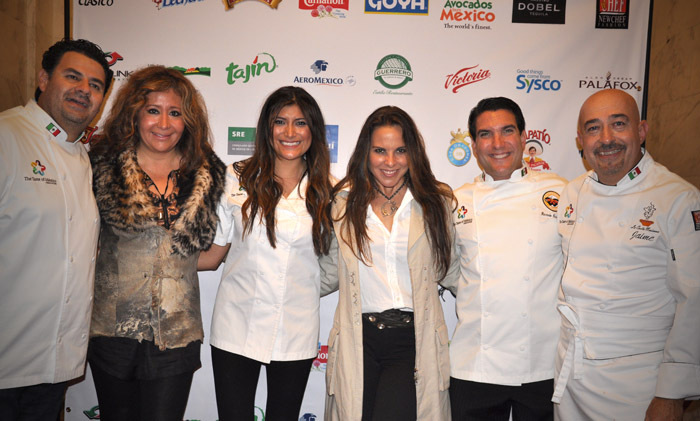 We’ve also got world-famous mixologists Pablo Moix and Steve Livigni and plenty of surprise guests (remember Kate del Castillo and Diego Boneta from year two?). The good news is, tickets are still on sale. But they’re getting swooped up fast, so we encourage you to head to the TOM website and place your order. Same as last year, we’re offering $50 General Admission entries and $70 VIP Packages, which include front-of-the-line access and exclusive mezcal tasting! We’ll be live Tweeting from TOM too, so make sure to follow our feeds for a bundle of food and drink pictures. Trust us when we say that this is the Mother of all Mexican food events. 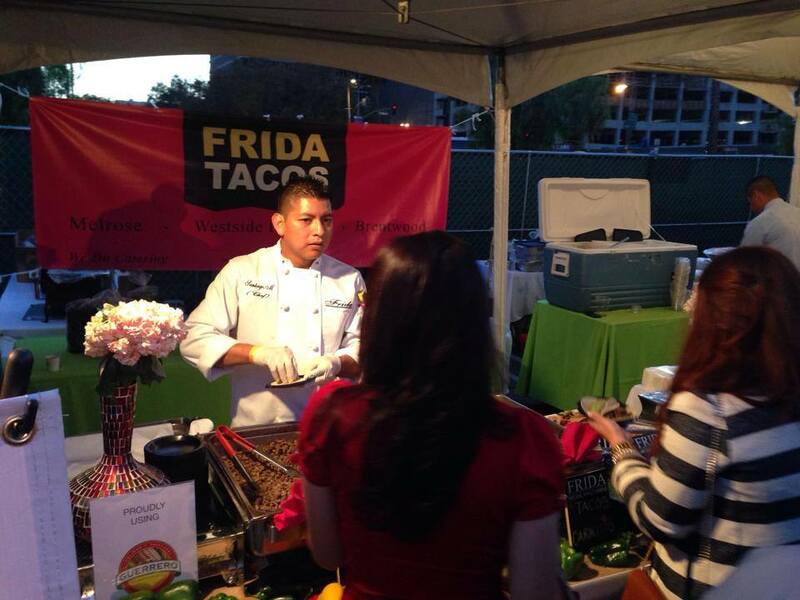 TASTE OF MEXICO 2013 is just a few short days away and we’d love to see you there! 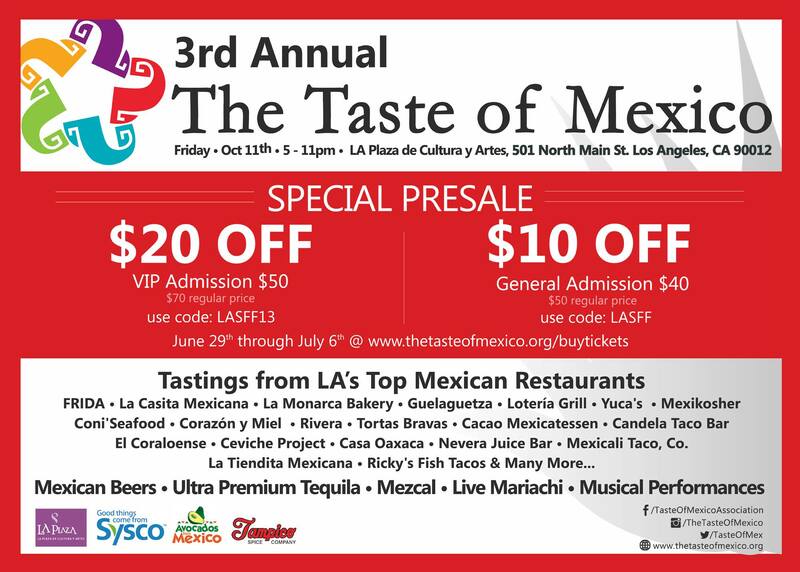 Special Pre-Sale Price For Taste Of Mexico Tickets! 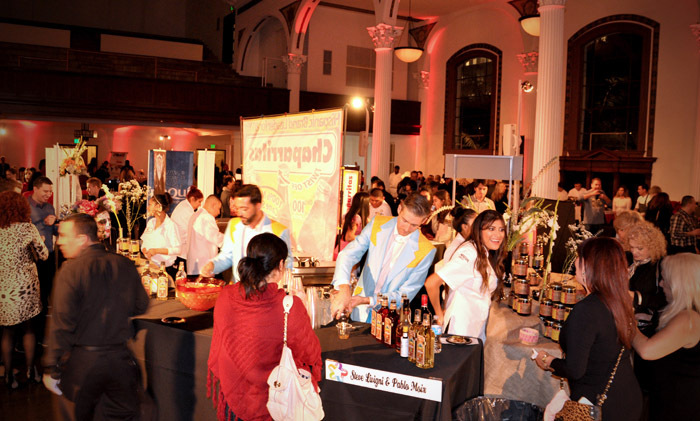 Back by popular demand, our TASTE OF MEXICO event is returning to downtown Los Angeles this October. And best of all, we’re offering a special pre-sale price if you enter the promotional code LASFF13 before buying your tickets. Now as you probably know, TOM has become one of Southern California’s most popular “foodie” phenomenons. Not only is FRIDA a major participant, so is Guelaguetza, La Monarca Bakery and La Casita Mexicana. And this year, several other top Mexican restaurants have signed on too, including Loteria, MexiKosher, Coni’Seafood, Yuca’s and Casa Oaxaca! Keep in mind that TOM covers a lot more than Mexican appetizers, entrees and desserts. We’ll be serving up delicious margaritas too, as well as high-end tequilas and buckets of cold cerveza. 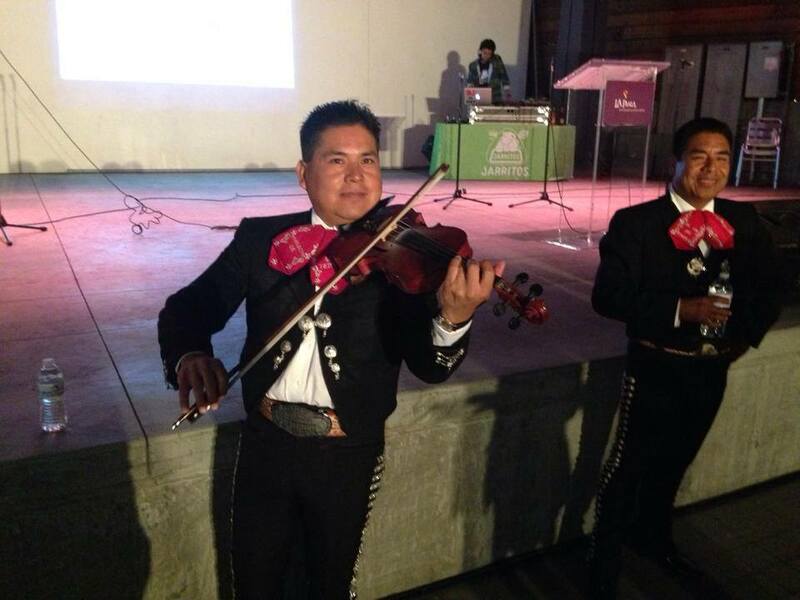 We’ll also have an evening’s worth of live entertainment, including some of the most talented mariachis in SoCal! 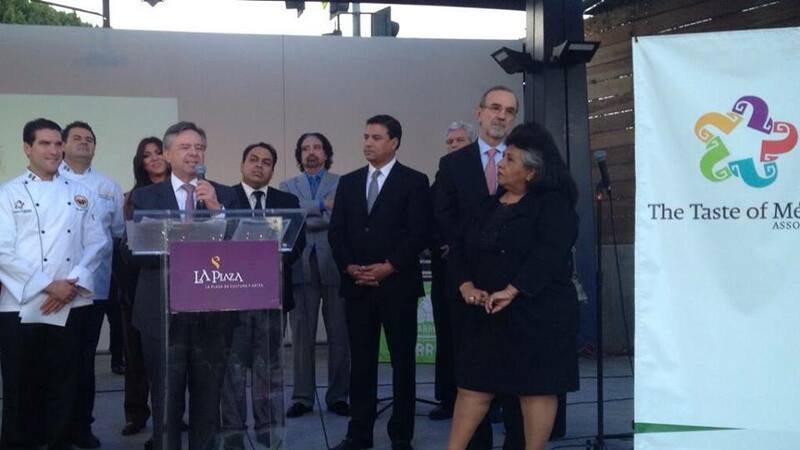 The event takes place during Hispanic Heritage Month at downtown L.A.’s La Plaza de Cultura y Artes. October 11 is the big day and we’ll be selling both traditional entry tickets and special VIP packages! Now here’s the really good part. Through the end of this month, fans can get $20 off the VIP price by entering the promotional code LASFF13 on Eventbrite. If you want a discount off the regular price, enter the code LASFF. Either way, it’s win/win and a fantastic way to spend an October Friday night. Just remember, the discounts only work until July 31. So make sure to visit Eventbrite and get your tickets today. 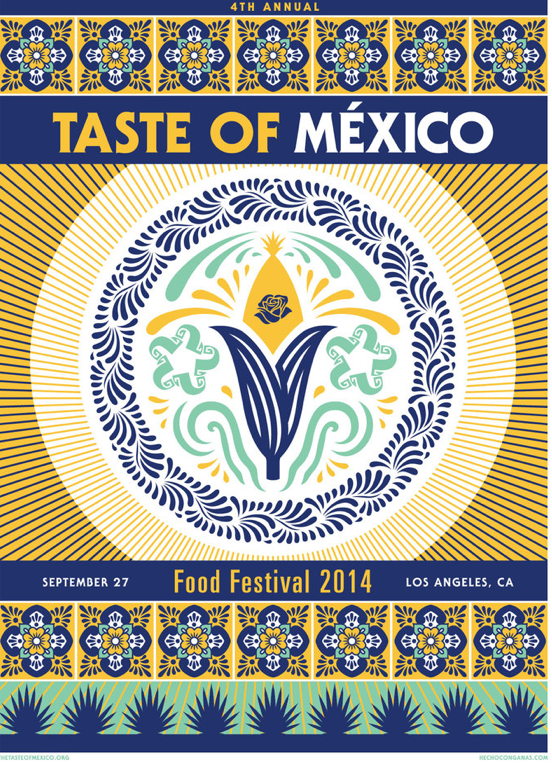 See you all at TASTE OF MEXICO 2013! The TASTE OF MEXICO Is Almost Here & We’re Giving Away Tickets! 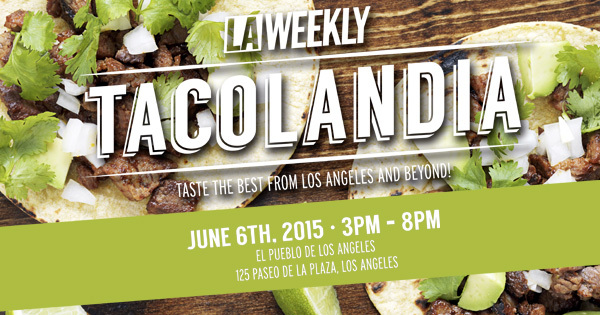 Believe it or not, LA’s premier Mexican food event is less than two weeks away. On Friday November 30, we will be kicking off our second annual TASTE OF MEXICO celebration at the Cathedral of St. Vibiana in downtown Los Angeles. And (of course) we would love for you to be our guests! But this year, we’re taking things one step further by giving our biggest fans the opportunity to WIN TWO FREE TICKETS! General pre-sale tickets for the event are $50 each, so two freebies equal a $100 value! More importantly, they will get you front and center with the most delicious Mexican tastemakers in Los Angeles. La Monarca Bakery, La Casita Mexicana, Guelaguetza and so many more will be participating with us. Plus, we’ll have baja wines, ultra premium tequila and live mariachi bands singing you well into the night. But the big question is…WHAT’S IT TAKE TO GET THE FREE TICKETS?! It’s actually extremely easy. All we’re asking for is an answer to the question, “What Do I Love Most About Mexican Food?” It can be the desserts, it can be the appetizers…heck, we’ll even consider the margaritas if your response is compelling enough. And we love the funny stuff too (though no profanity), so be as creative as you can with your answer. We’ll pick the one we like best by Tuesday November 27 and have your tickets waiting at the door. Here’s the one final catch – Your answer has to be 140 characters or less (the length of a Twitter post) to be considered. So think real hard and narrow down all of those wonderful tidbits about Mexican food into a concise, engaging statement. You can send it to us via the @CASAAZULCANTINA, @FRIDATACOS or @FRIDAMEXCUISINE Twitter pages or leave it posted on our Facebook wall ALWAYS WITH THE HASHTAG #TOM. And make sure you do it before November 28 because that’s the day we announce the winner! Of course if you’re not selected, don’t worry. We’ll still welcome you to the TASTE with open arms. Trust us, this is going to be an incredible event and we can’t wait to see you there! Have you made your Labor Day plans yet? Well cancel them immediately because we want to see you at the Paramount Lot September 1-3 for the 2nd annual L.A. Times TASTE Event! A true “feast” for the eyes and salivary glands, THE TASTE promises to deliver every type of culinary creation possible…and a ton of goodies from the FRIDA kitchen. Joining with our buddies from the TASTE OF MEXICO (La Monarca, Guelaguetza and La Casita Mexicana), the FRIDA fam will be front and center for all three days of the event. Expect to see items from our CASA AZUL and FRIDA TACOS menus, as well as some “special” surprises (wink, wink). We’ll also be hanging with legendary foodie Jonathan Gold for Saturday’s “Flavors of L.A.” event. And keep in mind, THE TASTE encompasses a lot more than appetizer samplers. This massive event hosts reps from 40 of So Cal’s top restaurants and has daily happenings like “Cocktail Confidential” and “Field To Fork.” There will also be tons of celebrity chefs in the house, including our very own Vicente Del Rio! So if you’ve got questions about how to cook up a homemade FRIDA quesadilla, don’t be afraid to ask. Truth be told, we are absolutely thrilled to be part of this historic event and would love for you to join us. And best of all, it’s a only a small hint of things to come. That’s right, this November the TASTE OF MEXICO is coming back in a major way. 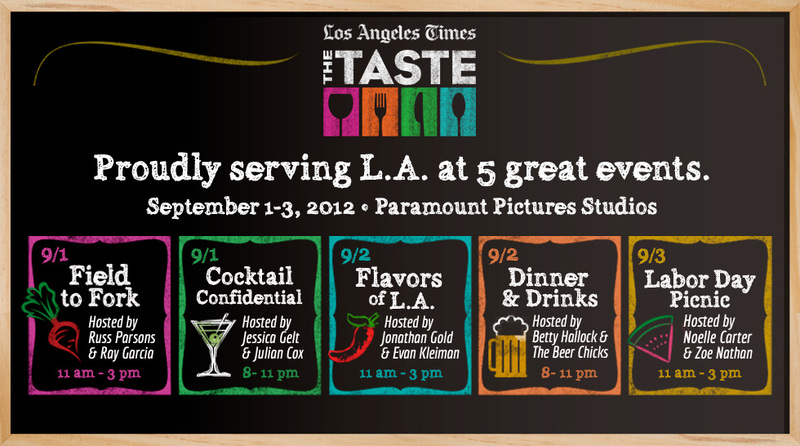 But before all that goes down, bring your appetite to Paramount Studios on Labor Day weekend. You won’t regret it! Click here to pick up your tickets for THE TASTE today!